Did you read the title of this article and ask yourself how that can even be possible? 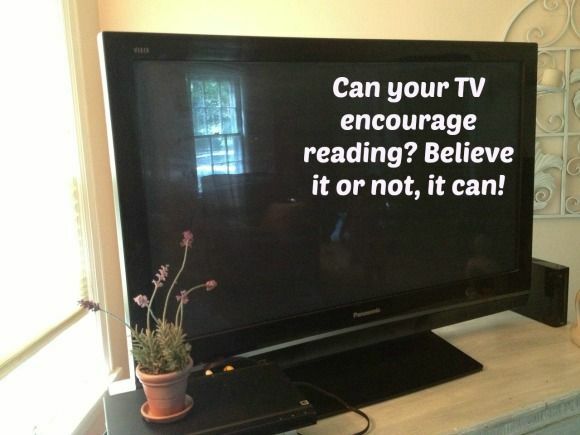 How on earth can a parent use television to encourage reading? Well believe it or not, you can! While most parents look at the television as not only a distraction but a challenge when trying to get their child to read, you should know there are ways parents are using as a tool to encourage reading. While this concept might sound rather foreign and tricky to you, you would be shocked at how simple it really is. Take a look below at 4 suggestions for how to use the television to encourage reading in children. Understanding adjectives is vital when a child reads as they are used to describe characters and settings. For this activity, talk to your child about adjectives and how they are descriptive words (for example short, tall, green, funny, skinny) and ask your child to describe their favorite television character using adjectives. You can put this list on a poster board if you wish or just do this activity verbally. This activity gives your child the chance to be the salesperson they see on television! Ask your child to pay attention to commercials. What are some words they hear frequently? What does the model or salesperson do to really sell the product? Have your child pick an item around the house and write their own commercial for it. Again, they will be building literacy skills vital to becoming a successful reader. One important skill to know when learning to read is to be able to identify genre. Is the story fiction? Non fiction? Biography? History? Memoir? In this activity, your child will learn how to classify stories. Have your child write down the name of 7 of her favorite television shows. Now have her put them into categories by genre such as cartoons, comedies, sports, or news. This helps her understand genres better and also to help you see what sort of selections she is watching. While your child is watching her favorite shows, have her keep a log of unfamiliar words she hears. Have her try to write down at least 5 per day. Then, using the internet or dictionary help her find the meanings of these words. Being able to build her vocabulary is an important literacy skill as is using a dictionary for reference. She will also be more aware of the words being used in her favorite shows. Do this activity together so should she have any questions, you are there to guide her. The television can be a great tool to encourage literacy in your child. The trick is to use it correctly and wisely and suggested in these four activities. Give these activities a try and see what a difference they can make to the skill building of your child as they continue to explore the wonderful world of reading. Who knew the television could be used to encourage such important skills? Now you do! Looking for more great ways to encourage reading in kids? Check out 7 Things Your Library Offers that Your E-Reader Can’t! Make your own commercials is a SUPER cute and very creative idea, thank you. We’re totally going to try this. What a brilliant idea! Now watching TV is not a distraction, thanks for sharing!